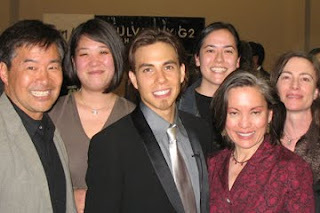 The Densho staff sends congratulations to Seattle's local hero Apolo Anton Ohno for a successful 2010 Winter Olympics. What an impressive athlete and gracious young man he is. We had the pleasure of meeting Apolo back in spring 2007 at a banquet held in his honor. Since we had to stand in line for our photo opp with the Dancing with the Stars winner, we're using this excuse to republish the picture. Congratulations to Apolo. He is an asset to the Japanese American community of Seattle.